Pelmeni, traditional dumplings that hold a near-sacred place in the hearts of the Siberian people inhabiting the Ural mountains, have made their way to convenience stores and the freezer sections of grocery stores all across Russia and Eastern Europe. But the modern convenience food and even homemade versions of pelmeni bare little resemblance to the traditional pelmeni recipe of the Urals which calls for a long, slow souring of dough. It’s a slow food in the best of terms, deeply ethnic, slowly tended over days and making the best use of foods native to the region: dill, cultured cream, fresh whey, wheat and an assortment of meats. Pelmeni or “little ears of dough” in the native language of the Komi-Permyak people of the Kama River Basin in the Western Urals, satisfy on a cold evening. It’s perhaps of my own love of harsh and bleak climates, that I feel an affinity for the rugged mountain people of the Urals, for when I first happened upon a traditional look at pelmeni through an article by Katherine Czapp of the Weston A Price Foundation, I fell in love. A subalpine people, the Komi-permyaks were hunters and the bounty of plentiful game filled their sacks and their pelmeni. Moose and other game, horse, beef or lamb found their way into the rustic, sour dumplings which, thanks to the region’s severe climate, could be easily frozen outdoors and thus preserved for long trips. Brawny, rugged hunters would fill their packs with pelmeni before entering the rigors of the Taiga to search for more game. In the years that pelmeni grew in favor, making their way from the pots and packs of Siberian hunters into freezer cases across Eastern Europe, the little dumplings lost a bit of their soul. No longer were they made from whole, soft winter wheat or soured over several days with fresh, bacteria-rich whey. No longer were they filled with wild meats. Instead, white flour took the place of whole wheat, and the tradition of fermenting the dough was lost completely. It’s time to bring the traditions of traditional foods, like pelmeni, back. Serves: About three to four dozen pelmeni dumplings. A traditional recipe for pelmeni that still calls for the slow souring of the pelmeni dough through fermentation aided by fresh whey. Pelmeni require an egg-based dough, which is kept at room temperature for several days to ferment. For this reason, it is essential that you only use fresh eggs from healthy hens allowed to graze on fresh pastured; not only are these eggs more nutrient-dense than those produced from hens in battery cages, but also they are much, much less likely to be contaminated with pathogens like salmonella. This recipe is adapted from Russian Cuisine, as translated by Katherine Czapp for the Weston A Price Foundation. Begin with the dough, a slow and lingering process. Dump two cups of flour onto your counter, making a well in the flour’s center, and place six egg yolks into the well along with a dash unrefined sea salt. Mix the dough together by hand, adding whey and stirring until no clumps of flour remain. Place the dough in a covered bowl and allow it to rest at room temperature for two to three days. Take care, every day, to flour your hands, punch down the dough, add about ½ to ¾ cup of additional flour and knead the dough for about five to ten minutes. On the third day, after you’ve fed the pelmeni dough with flour and kneaded it well, flour counters and role the dough into a long snake about 1½ to 2 inches thick. Allow the dough to rest while you prepare the pelmeni filling. 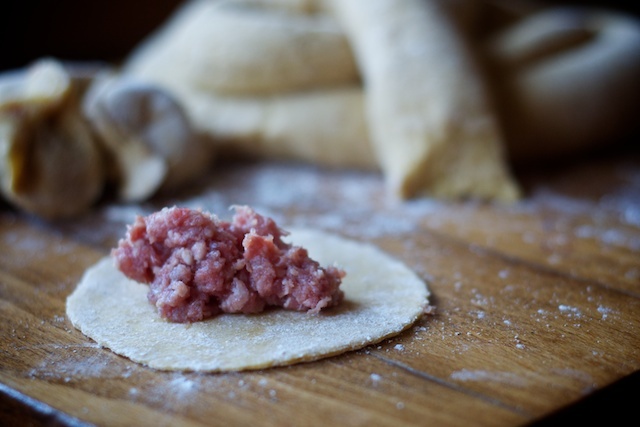 As the pelmeni dough rests, combine the ground meats together with one finely minced yellow onion and set aside. Pinch about one scant teaspoon dough from the pelmeni snake, flatten it into a circle and roll it out very thin – about 1/16th of an inch. Place the about one teaspoon pelmeni filling into the center of the rolled dough, fold in half, securing the edges of the pelmeni together so that it doesn’t open up when subjected to the rigors of boiling. Continue working the pelmeni dough and filling in this fashion until they’re both exhausted. Bring two quarts homemade beef stock or salted water to a boil, reduce the heat to a simmer and drop the filled and secured pelmeni into the pot to boil, working in batches of six to eight pelmeni so as not to overburden the pot. Allow pelmeni to simmer in the stock or salted water until they rise to the surface of their own accord, about three to four minutes, then remove them from the pot and set them aside as you continue working in batches until you’ve cooked all the pelmeni. Serve the pelmeni warm, topped with sour cream or crème fraïche, fresh snipped dill and seasoned to taste with a sprinkling of unrefined sea salt and freshly ground black pepper. Wow, I can’t believe I only just found this recipe! My grandmother always made pelmeni in a similar way, adding kefir or sour milk to the dough, wrapping it in a pillowcase and letting it sit around for a few days until it starts bubbling. Sometimes, she’d just add sourdough starter. She had this huge wooden bucket of the stuff that was over half a century old, passed on from generation to generation, a bit of which I now have in a jar 🙂 Its so sad that nobody makes real pelmeni any more. That is amazing that you still have some of that dough! I’ve enjoyed reading the History of the Pelmeni. Thank you for sharing! Back in the day when the cold war was ending, we had sponsored a Russian couple from Magadan to come to America for two weeks…their first time. They were amazed at our grocery stores…all the food you could get. They made three very memorable meals….Borscht (he put baby back ribs in each bowl and put the soup over the rib), an appetizer that didn’t have a name… made with raw beets and Jalepeno peppers, and Pelmeni…. they served their Pelmeni with malt vinegar and mustard in addition to the sour cream. I still make the appetizer and Pelmeni often! Can you share the recipe for the appetizer? It sounds really interesting. Awesome, I grew up on perogies with a cheese and potato filling and I have been wondering about a more traditional way to make the dough so we could enjoy this yummy meal more often. Also, the way we always cooked them was to boil in hot water and then drain and fry in a pan of butter. Wondering if you think this would work with this dough??? *If you do not keep a sourdough starter, simply replace half the water weight with raw kefir, or even kefir water. Kefir grains are a similar symbiotic colony of bacteria & yeasts than can raise dough. combine all the ingredients except the fat. Let it rest for about 5 minutes for the flour to absorb the water. If your dough is too wet, add more flour- it should be pliable and soft, but not runny. A little sticky is ok. Turn the dough out onto your counter and knead until the gluten is well developed (you can determine this by stretching the dough – it should be able to hold a very thin, translucent membrane without tearing). Once the gluten is well developed, knead in the fat. Leave it at room temperature overnight, about 8 hours. If you are using kefir, you may need to leave it longer. Separate the dough into balls (depending on the size you want your pirogi). Very gently (you don’t want to degas the dough too much) pat the piece of dough into a rough rectangle of your desired thickness, and spoon in some of the filling. Seal the pie shut. Leave in a warm place (my gran used to put them on top of our Russian stove – you can put them in an oven with the light on), for about 30 minutes. Bake in a preheated oven (about 220 Celcius) until golden – about 20 minutes, sometimes less. Depends on size of pirogi. Thank you so much for your recipe adapting the pelmeni to perogies I will certainly try. My mother also makes perogies with the potato and cheese, sometimes with saukraut. Can you make this gluten-free? This looks amazing and I love reading the history on these traditional foods. Two questions: my husband has gluten sensitivities – is there a good substitution I could use for this recipe? Also, he’s gearing up for boar and deer hunting – would those meats make a good filling for this? Thanks so much for sharing this with us! Is there any way to make this gluten free? I have some local venison that would do very nicely in this recipe! I love the history behind this, and we grew up with Pierogies..similar recipe. with any gluten, although I can tolerate sour doughs now. I wonder if a lentil flour or sunflower seed flour would work? We make these a lot here in Alaska and they are for sale in many stores and there is even a Pelmini shop in downtown Anchorage. . There is a huge Russian population here AND a lot of moose meat too. They are delicious served alone with sour cream or put back in the soup bowl with the broth on top. Truly a warm winter food. They are a lot of work to make though. I love the souring part of this recipe! It makes so much sense too. Thanks for sharing!!! I love reading about traditional foods like this. It always amazes me how much time and effort our ancestors put into preparing foods during their often difficult lives. Thanks for sharing! I think a combination of Gluten Free flours would work, you’ll find a good guide to Gluten Free flours here. http://glutenfreemommy.com/gluten-free-grains-101-the-best-flour-blend/ If wheat is the culprit and some gluten is ok than Spelt Flour would make a great replacement. Fascinating! I love the food history, thanks. Love the recipe Jenny. Just a thought…can regular pasta be made with a sourdough method? I printed this method/recipe from the WAPF site a couple of years ago. Now that you’ve refreshed my memory, I MUST make these! Question..Is it safe to allow egg yolks to be at room temperature for several days? These sound fabulous. I will have to make them if we get lucky and have venison in the freezer! You will find you love these and I suggest checking out ebay look up pelmeni to get a metal press to make them quicker. My wife is from Russia and we make these all the time. Just made these – what a lovely and tasty recipe! My husband and I gobbled up a big bowl each. I didn’t have enough soft white wheat flour so did a 50/50 mixture of that and sprouted buckwheat and they came out awesome. So I think you can probably sub flours around for what works with your family. Thanks so much for sharing! if you want to be more accurate. My Russian Grandparents taught my mother to make this dish. It is my childhood comfort food for lunch! Beautiful representation of this traditional dish! I was wondering if you might know the answer to this: I tried making this dough. There’s been no need to punch it down as it hasn’t risen at all. There’s no bubbling or anything like that. The dough smells fine – like normal dough. Do you think it’s still okay to use, and do you know why it hasn’t done anything? I’m really excited to try this recipe when I get some fresh eggs! I, too am inspired by ‘harsh and bleak climates. It would be interesting if you added that as a tag: Traditional recipe from harsh and bleak climates. It would be interesting to see how different cultures dealt with such a rugged life. I just love your website. I used to make these wonderful little meat and dough pies with my Grandfather , who was a Cossack. He insisted on making the dough with strong TEA, telling me that for sure I would NEVER find a like recipe…..and I never have. I suggest you try the strong tea idea. You will never make the pelmeni with water again! Great recipe! I have never had pelmeni with a dough like this. I have never made whey but online it says you can from plain yogurt in strainer overnight. I’m always scared of messing with bacterias. I have ukrainian family. They make mostly vareniki. Hester Kalin – tea dough?! Wow! Interesting. Strong tea? Black tea I assume? What is soft winter wheat flour? is it whole wheat cake flour? Twice now my dough has developed a dark brown (almost black) layer on top after the first day of fermenting. The first time, I had put it in a bowl with a lid and the second time, a bowl with plastic wrap. Is this dough safe to use? Is this normal or is there something I should do to prevent the discoloration? That hasn’t been my experience so, I’m not sure what to suggest. If it smelled foul or was dark, like it had molded, I would discard it.